China has become the world's largest distant-water fishing nation through merging small, weak companies into bigger internationally competitive modern companies, as well as building fishing bases with intelligent technology. Now the country's fishing industry is facing a bigger opportunity brought by the China-proposed Belt and Road initiative (BRI). As the growing middle class in China is increasingly demanding deep seawater products with high-quality protein, China has become the world's largest distant-water fishing nation, having one quarter of the world's fishing boats. However, with the continuous development of China's distant-water fishing industry, the challenges are also looming large. The most striking one is the over-exploitation of global marine resources. Recently, the Global Times visited the national distant-water fishing base in Zhoushan, East China's Zhejiang Province, to find out how China's distant-water fishing industry copes with the challenge to achieve further and sustainable development. According to monitoring conducted by the Food and Agriculture Organization (FAO), the proportion of fish stocks within the limits of biological sustainability had decreased from 90 percent in 1974 to 66.9 percent in 2015. Meanwhile, the proportion of fish stocks caught at unsustainable biological levels increased from 10 percent in 1974 to 33.1 percent in 2015. Fish stocks that have not been fully captured have continued to decline from 1974 to 2015. By 2015, they accounted for only 7 percent of the total assessed population. As one of the major producers, China has recently started setting restrictions on the number and size of distant-water fishing companies. "As a producer, China cares about the protection and sustainability of marine resources more than any other countries. It's our livelihood that will suffer a loss if the resources are exhausted," Liu Xinzhong, deputy director of fisheries bureau of the Ministry of Agriculture and Rural Affairs of China, told the Global Times. So far, the number of China's distant-water fishing companies has decreased from 167 in 2015 to 159 in 2017, the number of fishing ships has decreased from 2,512 in 2015 to 2,491 in 2017. The Chinese government has set two red lines to guide the approval of distant-water fishing ships: to limit the number of ships within 3,000 by 2020, and to stop the number of companies from growing. 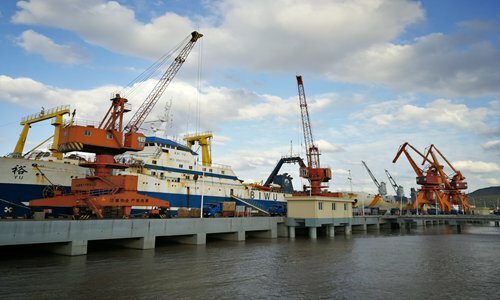 In spite of the decreases of fishing ships' sizes and amounts, China's distant-water fishing industry is realizing growth and making a breakthrough through renovation and improved efficiency, Liu said. At present, Chinese fishing companies are phasing out old fishing boats, reforming existing fishing vessels in terms of sanitation and safety, improving production efficiency and making products that meet the higher international standards of the EU and US to expand the markets. Meanwhile, merger, reorganization and competition are also ongoing within the industry. China is changing the industry by promoting large distant-water fishing companies to merge a large number of small, weak companies, especially those actually owned by big companies. In this way, China can build large and well-managed as well as internationally competitive modern distant-water fishing companies. China's distant-water fishing production is steadily growing in spite of restrictions on fishing companies' sizes and numbers. Yu Kangzhen, vice minister of Agriculture and Rural Affairs of China, told the Global Times that the total production in the industry has reached 2.09 million tons at the value of 23.6 billion yuan in 2017, increasing 14.5 percent from 2015. The structure of China's distant-water fishing industry is still relatively simple. The scientific support and complex development ability are still relatively low. The industrial construction is lagging behind and the market is not fully developed. To solve these problems, it's necessary to develop the industry with the support of modern technology. Zhan Wei, deputy general manager of Dayangshijia, a distant-water fishing company based in East China's Zhejiang Province, told the Global Times that the company has installed an intelligent exploration system on all fishing ships since 2017. The systems can send real-time location data back to prevent accidents and increase production. "This system helps us measure water temperature and make fishery analysis at any time," Wei said. "We can detect the real-time water temperature on the surface, the middle layer and the deep layer of the ocean. We can locate what types of fish that can be caught in each area and the changes in production. We can also record on the big platform database to provide guidance and help for future work," Wei noted. Building distant-water fishing bases and expanding industry chains to produce products with added value is another measure adopted by many companies to cope with the challenges mentioned above. The core area of the national distant-water fishing base in Zhoushan is about 6.23 square kilometers and can accommodate 1,300 fishing boats at the same time, attracting more than 200 enterprises. The base is aimed at "one port, one city, one district and one center". Huang Baoshan, director of the China Fisheries Association, told the Global Times that "from raw fish to products with a high value, fishery bases help to expand the domestic market and build competitive brands. In this regard, China will still have huge potentials to grow." Although there is a challenge, China's distant-water fishing industry is also facing a good opportunity as former leading players, such as the US, EU, Japan and South Korea, are slowly retreating from the industry, and importing fishing products from China. On the other hand, the promotion of the China-proposed Belt and Road initiative (BRI) has also led more and more developing countries to look forward to enhancing local tax revenues and employment through cooperation with China in the field of distant-water fishing. Liu said more and more international industry management organizations are inviting China to join, which means that Chinese fisheries not only can get more global fishing quotas, but also begin to participate in making international industry rules. "Many countries are also increasingly willing to invite Chinese companies to establish local fishery bases and participate in the construction of transshipment terminals. The cooperation mode has gradually changed from single-type fishing to full-scale cooperation including processing and breeding," Liu said.